Whether you enjoy them or fear them, clowns are a fascinating case study of the human psyche, and in turn, art. 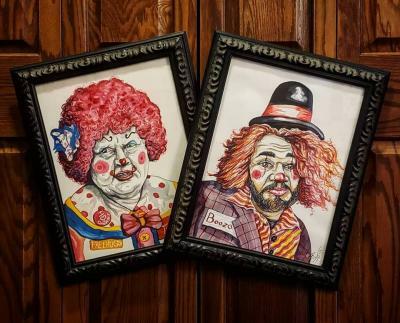 Artlore Studio's new exhibition will explore the multifaceted nature of clowns across a variety of mediums. In movies, in literature, and in everyday life, clowns — supposed forces for all that is good and humorous in the world — nonetheless convey an undercurrent of sinister darkness that is hard to shake. How many photos have you seen of toddlers being held by frantic-smiled, red-cheeked, orange-haired figures, and the kids themselves were grinning? What is it about clowns that makes them so fascinating…and at times, fear-inducing? Why have clowns developed such an uneasy reputation in recent times? Artlore Studio, on Erie's west side, has brought together a large group of local artists who have explored these most antic of figures, representing them in a variety of mediums. According to Stephen Trohoske, co-owner of Artlore with Lena Logvina, these include "acrylic, oils, photography, mosaic, sculpture" and even "alternative process." "They're all focused around the history, moods, and appeal of clowns," he said, adding, "Clowns and artists have a long history together … the colors, performance, outfits, and the different moods of the clown made them interesting, and sometimes challenging, to artists." Not only will the opening of Clowns feature the artwork of incredible local talents, from 7 to 9 p.m. Artlore will host live music from Adam Holquist, Nick Warren, and Trohoske himself, whose purpose-made composition "will move more like a soundscape." Guests will feel submerged in the "soundscapes, samples, melodic beauty and angular sweeps for this show." Attendees can also marvel at an original Red Skelton clown painting, which has been donated for viewing for the evening. Red Skelton, a comedian and actor during the Golden Age of Hollywood, famously painted over 1,000 works featuring clowns.